Figure 1 - Comparative low light images of a USAF resolution chart, showing Andor sCMOS (1.3 electrons read noise @ 560 MHz) vs Interline CCD (5 electrons read noise @ 20 MHz), under the two lowest LED settings. sCMOS technology is unique in its ability to overcome many of the mutual exclusivities that have marred other scientific detector technologies, resulting in an imaging detector that simultaneously optimizes a range of important performance parameters whilst maintaining Snapshot exposure capability. Many scientific imaging applications demand multi-megapixel focal plane sensors that can operate with very high sensitivity and wide dynamic range. Furthermore, it is often desirable that these sensors are capable of delivering rapid frame rates in order to capture dynamic events with high temporal resolution. Often there is a strong element of mutual exclusivity in these demands. For example, it is feasible for CCDs to achieve less than 3 electrons rms readout noise, but due to the serial readout nature of conventional CCDs, this performance comes at the expense of frame rate. This is especially true when the sensor has several megapixels of resolution. Conversely, when CCDs are pushed to faster frame rates, resolution and field of view are sacrificed (i.e. fewer pixels per frame to read out) or read noise and dynamic range suffer. By way of illustration, consider one of the most popular, highperformance front-illuminated scientific CCD technologies on the market today – the Interline CCD. These devices are capable of reading out at 20 megapixel/s per output port with a respectable read noise of only 5 to 6 electrons rms. At this readout speed a single port 1.4 megapixel sensor can achieve 11 fps. Use of microlenses ensures that most of the incident photons are directed away from the Interline metal shield and onto the active silicon area for each pixel, resulting in peak QE greater than 60%. High performance combined with low cost has made the Interline CCD a very popular choice for applications such as fluorescence cell microscopy, luminescence detection and machine vision. However, even 5 to 6 e- noise is too high for many low light scientific applications. For example, when imaging the dynamics of living cells, there is a need to limit the amount of fluorescence excitation light, such that both cell phototoxicity and photobleaching of the fluorescent dyes is minimized. The use of lower power excitation results in a proportionally lower fluorescent emission signal from the cell. Also dynamic imaging yields shorter exposure times per frame, thus fewer photons per frame. Ultra low light conditions mean that the read noise floor can often become the dominant detection limit, seriously compromising the overall signalto- noise ratio (SNR) and hence the ability to contrast fine structural features within the cell. As such, the inability to maintain low noise at faster readout speeds limits the overall flexibility of the Interline CCD camera. Figure 2 - Comparative low light images taken with Andor sCMOS (1.3 electrons read noise @ 560 MHz) vs Interline CCD (5 electrons read noise @ 20 MHz) vs back-illuminated EMCCD (< 1 e- read noise), under extremely low light conditions (10 photons / 6.5 μm setting). sCMOS and Interline CCD were 2 x 2 binned in order to have the same effective pixel pitch (and light collection area per pixel) as the 13 μm pixel of the EMCCD sensor. 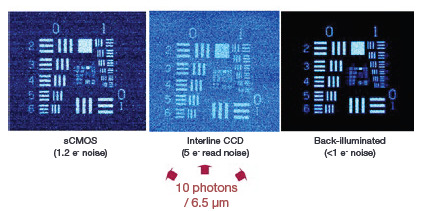 The Electron Multiplying CCD (EMCCD) was introduced into the market by Andor in 2000 and represents a significant leap forward in addressing the mutual exclusivity of speed and noise as discussed above. EMCCD cameras employ an on-chip amplification mechanism called ‘Impact Ionization’ that multiplies the photoelectrons that are generated in the silicon. As such, the signal from a single photon event can be amplified above the read noise floor, even at fast, multi- MHz readout speeds. Importantly, this renders the EMCCD capable of single photon sensitivity at fast frame rates (e.g. 34 fps with a 512 x 512 array). This attribute has rapidly gained recognition for EMCCD technology in demanding low light measurements, such as single molecule detection. 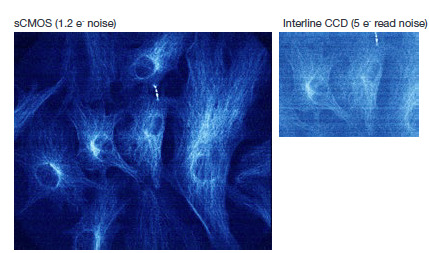 Figure 3 - Comparative low light images taken with Andor sCMOS (1.3 electrons read noise @ 560 MHz) vs Interline CCD (5 electrons read noise @ 20 MHz) of fluorescently labelled fixed cell using a CSU-X spinning disk confocal microscope (x60 oil objective), each 100 ms exposure, same laser power, displayed with same relative intensity scaling. Note, the field of view is limited by the aperture size of the CSU-X, which is matched to the 1.4 megapixel Interline sensor. However, despite the sensitivity under extremely low light conditions, there are a few remaining drawbacks of EMCCD technology. The amplification mechanism required to reduce the effective read noise to < 1e-, also induces an additional noise source called multiplicative noise. This effectively increases the shot noise of the signal by a factor of 1.41, which is manifested as an increase in the pixel to pixel and frame to frame variability of low light signals. The net effect of multiplicative noise is that the acquired image has a diminished signal-to-noise ratio, to an extent that the QE of the sensor can be thought to have been effectively reduced by a factor of two. For example, a QE-enhanced back-illuminated EMCCD with 90% QE has effectively 45% QE when the effects of multiplicative noise are considered. Dynamic range limitations of EMCCDs must also be considered. It is possible to achieve respectably high dynamic range with a large pixel (13 to 16 μm pixel size) EMCCD, but only at slow readout speeds. As such, higher dynamic range can only be reached at slower frame rates (or with reduced array size) with modest EM gain settings. Application of higher EM gain settings results in the dynamic range being depleted further. Sensor cost of EMCCD technology is an additional consideration, along with the practical restriction on resolution and field of view that accompanies sensor cost. Presently, the largest commercially available EMCCD sensor is a back-illuminated 1024 x 1024 pixel device with 13 μm pixel pitch, representing a 13.3 x 13.3 mm sensor area. This already carries a significant cost premium, making further expansion to multimegapixel devices a costly proposition. Table 1 - Frame rate vs sub-window size; Rolling and Global Shutter readout modes. N.B. Same sub-window frame rates apply when using full horizontal width with the vertical heights indicated (see body text for further detail). Scientific CMOS (sCMOS) technology is based on a new generation of CMOS design and process technology. This device type carries an advanced set of performance features that renders it entirely suitable to high fidelity, quantitative scientific measurement. sCMOS can be considered unique in its ability to simultaneously deliver on many key performance parameters, overcoming the 'mutual exclusivity' that was earlier discussed in relation to current scientific imaging technology standards, and eradicating the performance drawbacks that have traditionally been associated with conventional CMOS imagers. 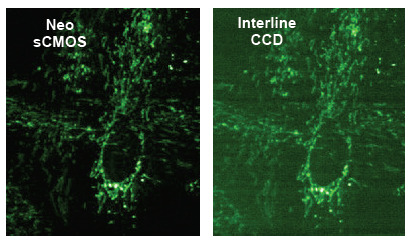 Figure 4 - Comparative low light fluorescence microscopy images taken with Andor sCMOS (1.3 e- @ 560 MHz) vs Interline CCD (5 e- @ 20 MHz) under low light conditions, typical of those employed in dynamic live cell imaging. 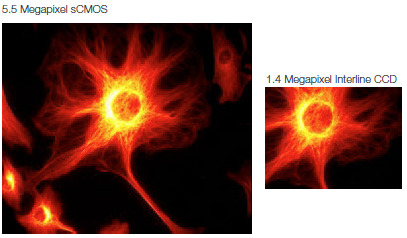 ND filters on a widefield fluorescence microscope were used to reduce light levels relative to the read noise floor. The 5.5 megapixel sensor offers a large field of view and high resolution, without compromising read noise or frame rate. 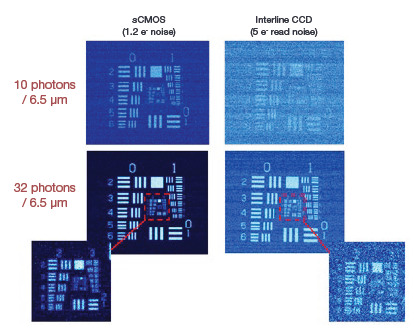 The read noise in itself is exceptional, even when compared to the highest performance CCDs. Not even slow-scan CCDs are capable of this level of read noise performance. High-resolution, slow-scan CCDs are typically characterized by seconds per frame rather than frames per second. The fact that the sCMOS device can achieve 1 electron rms read noise while reading out 5.5 megapixels at 30 fps renders it truly extraordinary in the market. Furthermore, the sensor is capable of achieving 100 full fps with a read noise 1.3 electrons rms. By way of comparison, the lowest noise Interline CCD reading out only 1.4 megapixels at ~ 16 fps would do so with ~ 10 electrons read noise. Greater speed is available through selection of ‘region of interest’ sub-windows, such that the field of view can be traded off to achieve extreme temporal resolution. Table 1 shows frame rates that can be expected from a series of sub-window sizes, in both rolling shutter and global shutter modes of operation (the distinction between these two modes is explained later in this paper). Note that each of the subwindows can be expanded to full width in the horizontal direction and still maintain the same indicated frame rate. For example, both 1390 x 1024 and 2560 x 1024 sub-window sizes each offer 220 fps in rolling shutter mode. This is important information for some applications that can take advantage of an elongated (letter box shape) region of interest. Figure 5 - Theoretical Signal to Noise plot comparisons for sCMOS vs Interline CCD sensors. Photon flux (i.e. input light intensity) is given in terms of photons per 6.5 μm pixel of each sensor type. The low noise readout is complemented by a high dynamic range of 30,000:1. Usually, for CCDs or EMCCDs to reach their highest dynamic range values, there needs to be a significant compromise in readout speed, yet sCMOS can achieve this value while delivering 30 fps. Furthermore, the architecture of sCMOS allows for high dynamic range by offering a large well depth, despite the small pixel size. By way of comparison, a 1.4 megapixel Interline with similarly small pixels achieves only ~1,800:1 dynamic range at 16 fps. A short comparative overview of sCMOS is provided in Table 2. For the purposes of this exercise, we limited the comparison to Interline CCD and EMCCD technologies, given their popularity across the range of scientific imaging applications. Interline CCDs are typified by a choice of 1.4 megapixel or 4 megapixel sensors. The most popular EMCCD sensors are 0.25 or 1 megapixel, typically offering up to 30 fps. Figure 6 - Theoretical Signal to Noise plot comparisons for sCMOS vs Interline CCD vs back-illuminated EMCCD sensors. For purposes of a objective comparison, it is assumed that the ~6.5 μm pixels of the sCMOS and Interline CCD sensors are 2 x 2 binned in order to equal a 13 μm pixel of a back-illuminated EMCCD. It is apparent that across most parameters, sCMOS presents a distinct performance advantage, notably in terms of noise, speed, dynamic range and field of view/resolution. Importantly, these advantages are met largely without compromise. Whilst the read noise of sCMOS is very low, EMCCD technology still maintains the distinct advantage of being able to multiply the input signal above the read noise floor, thus rendering it negligible (<1 e-). The majority of EMCCD cameras purchased at this time are also of back-illuminated, having ~ 90% QE max, which also feeds into the sensitivity comparison. For this reason, EMCCD technology will still hold firm in extreme low-light applications that require this level of raw sensitivity, and are willing to sacrifice on the enhanced resolution, field of view, dynamic range and frame rate that sCMOS can offer. Table 2 - Comparison summary of typically specifications of Interline CCD and EMCCD technologies compared to sCMOS technology. Figures 1 to 4 show the results of head to head sensitivity comparisons, pitching a prototype 5.5 megapixel sCMOS camera against a 1.4 megapixel Interline CCD device, and also against 1 megapixel backilluminated EMCCD. The sCMOS was set up to image at 560 MHz, this readout speed capable of achieving 100 full fps, with only 1.3 electrons read noise. The Interline CCD camera, an Andor ‘Clara’, was read out at 20 MHz, achieving 11 fps with 5 electrons read noise (representing extreme optimization of this sensor at this speed). The EMCCD camera, an Andor iXon 888, was read out at 10 MHz with x300 EM gain amplification, achieving 9 fps with 0.15 electrons effective read noise. Low light imaging conditions were created using (a) a light tight imaging rig, fitted with a diffuse, intensity-variable 622 nm LED light source and mask overlay (consisting either an array of holes or a USAF resolution chart); (b) both confocal spinning disk and conventional widefield fluorescence microscopes, imaging fixed bovine epithelial cells labelled with BODIPY FL (emission max. ~ 510nm). Figure 7 - Field of view comparison of two technologies; x60 magnification; 1.25 NA; 5.5 megapixel Andor sCMOS vs 1.4 megapixel Interline CCD (each have ~ 6.5 μm pixel pitch). sCMOS is capable of offering this larger field of view @ 100 frame/s with 1.3 e- read noise. The LED rig proved excellent for comparing sensitivity under extreme low light conditions, using two low light intensity settings; 10 photons/6.5 μm and 32 photons/6.5 μm. The SNR superiority of sCMOS over even well-optimized Interline CCD technology can clearly be observed, manifest as better contrast of signal against a less noisy read noise background, resulting also in better resolution of features. However, comparison of the two technologies against backilluminated EMCCD (figure 2) at the weakest LED setting, showed that the < 1 electron noise floor and higher QE of the EMCCD resulted in notably superior contrast of the weak signal from the noise floor. 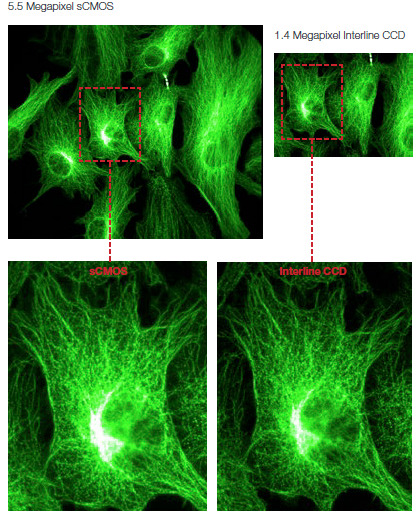 Figures 3 and 4 show clear differences in low light signal contrast between sCMOS and Interline cameras, employed on both spinning disk and widefield fluorescence microscopy set-ups. Again the contrast difference arises from the read noise difference between the two technologies. To further supplement the relative sensitivity performance of these imaging technologies, theoretical SNR plots that are representative of these three technologies are given in Figures 5 and 6. For this comparative exercise, specifications were used that reflect the most sensitive Interline CCD and back-illuminated EMCCD sensors on the market today. 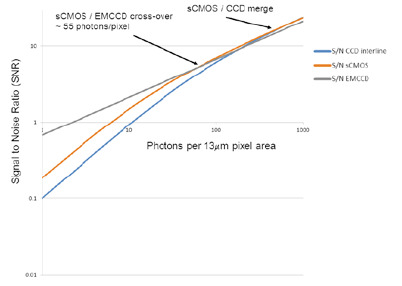 Figure 5 shows how the SNR of sCMOS compares to that of Interline CCD across a range of photon fluxes (i.e. incident light intensities). The pixel size differences between the two sensor types is negligible, thus there is no need to further correct for differing areas of light collection per pixel. The sensitivity differences between the two technology types is reflected in the marked variance between the respective SNR curves at low to moderate photon fluxes. At higher photon fluxes, there is no 'cross-over' point between sCMOS and Interline CCD curves. Similar QE and pixel size ensures that the Interline CCD will never surpass the SNR performance of sCMOS. In fact, due to the significantly lower read noise, the sCMOS exhibits markedly better signal-to-noise than the Interline CCD until several hundred photons/pixel at which point the two curves merge as the read noise of both sensors becomes negligible compared to the shot noise. Figure 6 shows SNR plots that compare sCMOS and Interline CCD sensors with that of back-illuminated EMCCD sensors. The plot assumes that all three sensors have the same pixel size, which could effectively be the case if the ~ 6.5 μm pixels of both the sCMOS and Interline CCD sensors were to be operated with 2 x 2 pixel binning, to equal a 13 μm EMCCD pixel (representative of a popular back-illuminated EMCCD sensor on the market). As such, the photon flux is presented in terms of photons per 13 μm pixel (or 2 x 2 binned super-pixel), relating to an actual pixel area of 169 μm2. 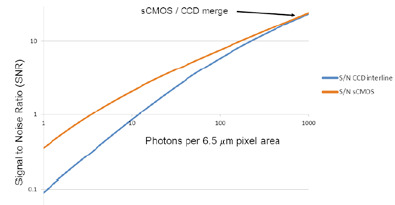 There are two notable cross-over points of interest, relating to where the EMCCD S/N curve crosses both the sCMOS and Interline CCD curves, which occur at photon flux values of ~ 55 photons/pixel and ~ 225 photons/pixel, respectively. At photon fluxes lower than these cross-over points the EMCCD delivers better S/N ratio, and worse S/N ratio at higher photon fluxes. The reason that a back-illuminated EMCCD with negligible read noise does not exhibit higher S/N right throughout the photon flux scale, is due to the multiplicative noise of the EMCCD plot (which effectively increases the shot noise). Figure 8 - Field of view and resolution comparison of two technologies; x100 magnification; 1.45 NA; 5.5 megapixel Andor sCMOS vs 1.4 megapixel Interline CCD (each have ~ 6.5 μm pixel pitch). Figures 7 and 8 show widefield fluorescence microscope images, taken using x60 and x100 magnifications respectively, comparing 5.5 megapixel sCMOS to 1.4 megapixel Interline CCD technology. Each clearly reveal the markedly larger field of view capability of the 5.5 megapixel sCMOS sensor. Since each sensor type has ~ 6.5 μm pixel pitch, allowing for adequate NyQuist oversampling at the diffraction limit, it is unsurprising that each show virtually identical resolution of fine intracellular structure under brighter conditions, as shown in Figure 8. At low photon fluxes however, typified in figures 3 and 4, the higher read noise of the Interline device results in greater sacrifice in resolution and contrast. This is a decisive point for live cell measurements, which often necessitate the use of low illumination energies. After several decades of technology maturation, we have now reached a 'leap forward' point, where we can confidently claim that the next significant wave of advancement in high-performance scientific imaging capability has come from the CMOS imaging sensor technology stable. Scientific CMOS (sCMOS) technology stands to gain widespread recognition across a broad gamut of demanding imaging applications, due to its distinctive ability to simultaneously deliver extremely low noise, fast frame rates, wide dynamic range, high quantum efficiency, high resolution and a large field of view. Comparisons with other current 'gold standard' scientific image detector technologies show that the CIS 2051 sCMOS sensor, optimized in the Andor Neo camera, out-performs even highperforming interline CCD camera in most key specifications whilst maintaining a Snapshot exposure mode for broader application flexibility. For extremely low light applications that require absolute raw sensitivity at respectably fast frame rates, a high performance backilluminated EMCCD camera (present in the Andor iXon range) maintains an application advantage.